Photos by Liz Martiniak. © Liz Martiniak 2002; all rights reserved. XALAPA FARM was owned by Edward F. Simms in the first quarter of the 1900s. In 1920, Simms purchased a pair of successful stallions and moved them from France to the farm near Paris, Kentucky. They were *PRINCE PALATINE and *NEGOFOL. *PRINCE PALATINE's best years were behind him, and he left behind the French-bred Rose Prince, who would continue the sireline through Prince Rose to *Princequillo, Prince Chevalier and Prince Bio. *NEGOFOL was more successful, siring English-foaled *Hourless and in America got Coventry, Vito, Espino, Sweet Verbena among his best. 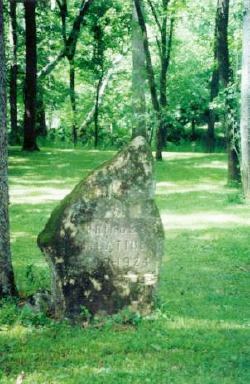 *PRINCE PALATINE died in a tragic barn fire in October of 1924 and was buried on the farm, his grave marked with the stone (above). *NEGOFOL died in 1928 (it's not known if he is buried at the farm). More recent burials at Xalapa are the mares MYSTERY MOOD, SPLENDID SPREE, and WITHERITE. MYSTERY MOOD (1972 by Night Invader) was a stakes winner and dam of 3 stakes winners including Maximilian, Mystical Mood and Mythical Hunter. SPLENDID SPREE (1970 by Damascus) was unraced and produced 2 stakes winners, Splendid Way and Santa Anita Derby winner Splendid Spruce. WITHERITE (1958 by Ky. Colonel) was a stakes winner and dam of the outstanding sprinter Chou Croute and Clipsetta Stakes winner Pretty Nurse.